Education activists opposed to corporate-based school reform are converging on Washington D.C. next week for the second annual United Opt Out National event on the grounds of the U.S. Education Department. Among those who will be speaking at the event are education historian Diane Ravitch, Chicago Teachers Union President Karen Lewis, veteran educator Deborah Meier, and early childhood expert Nancy Carlsson-Paige. The four-day event — to be attended by teachers, students, parents and others — will start on April 4th and include a march to the White House in an effort to get the attention of President Obama, who has been a big disappointment to people who thought he would push progressive school reform policies. Instead, his Education Department has pushed a corporate-based reform agenda that includes an accountability system based on standardized tests — against the advice of assessment experts — and initiatives that have fueled the privatization of public education and attacks on teachers. 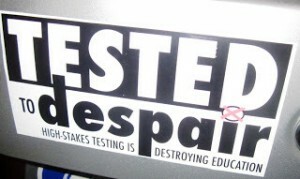 The Opt Out event is part of a growing revolt against standardized test-based school reform. Students have staged protests in different states; school boards across the country have passed resolutions against high-stakes tests; teachers staged a strike in Chicago and in Seattle refused to administer a standardized test they say is flawed; principals, superintendents, researchers and others have signed petitions urging an end to the abuse of high-stakes testing; a growing number of students are opting out and refusing to take standardized tests.